Part of the Green Girly Goodies Event is going green! 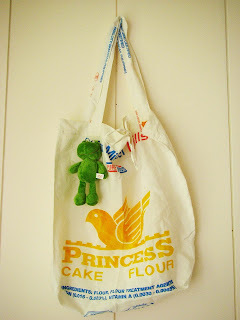 I absolutely love love love what Noelle at Brown Belly has done with old flour sacks. She has made some amazing totes, great to use for library books, the market or even yarn if you knit! You can purchase a tote at Brown Belly for only $10! What a steal!!! For that price grab a few extra for your friends and help them become more green. Noelle has graciously offered one reader their own tote (pictured above)! Go to Brown Belly and tell me something else you really like! Thank you to Brown Belly for providing the tote to giveaway!!! I like the Purple Ruffle Romper. I like the Love Me Tank Dress, cheerful and breezy! Thanks for the giveaway. #1 I subscribe, thank you. #2 I subscribe, thank you. The Dakota bag is gorgeous! I like the Dakota Bag! I follow Brown Belly on Twitter. I like the Desert Sun Tank Dress. I just love the Purple Ruffle Romper! The Dakota bag is divine. I love the colour combo of the Cocoa Sash Pants. Thanks! I like the Dakota Bag. I like the Breezy Wrap Pants. Breezy wrap pants and the purple tank dress. I like the Dakota tote. I like the Breezy Sash Wrap Pants in brown/pink. I like the cabana dress. I just discovered your bloga nd love it. I will be following you! Ooh, I covet the White Ethnic Print Thai Pants. I like the shell bangles! I grabbed your Green Girly Goodies Button. I like the tank dress. I like the Thai pants and the Dakota bag! Really like the High Waist Batik Print Skirt. I love the Dakota Bag! I follow your blog and would love for you to follow mine! I am your friend by following you on FB!